Learn how we help B2B/SaaS companies get to $5M+ ARR. Members get access to up to 4 hours of live coaching per week for up to 12 months. Anytime access to actionable materials you can immediately apply to save time. Get broader feedback from a community of 80+ B2B CEOs in between live coaching calls. Develop a repeatable sales process that's tailored to your unique product and market to attract customers, funding and the best talent. 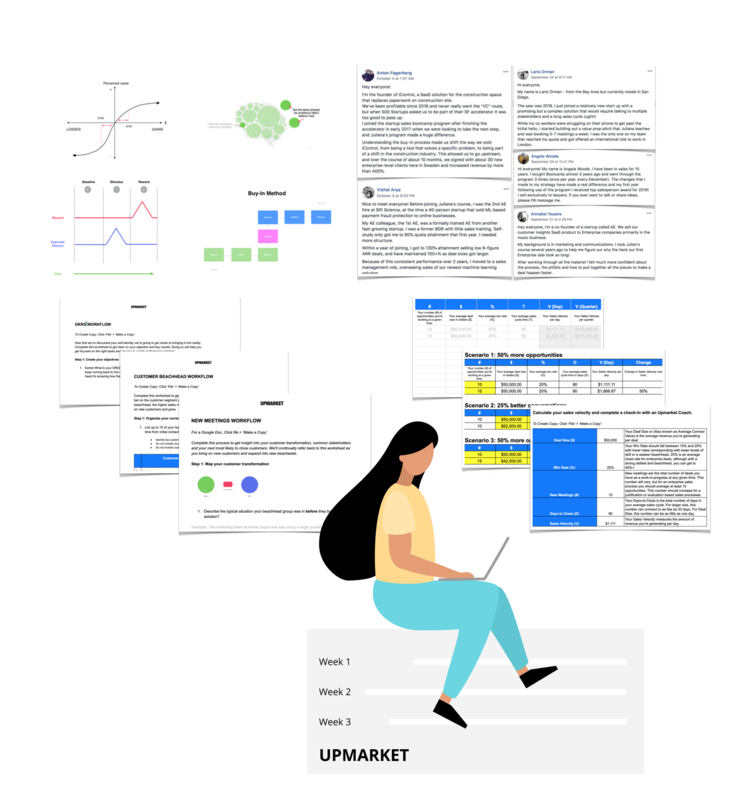 Our proven methods help you dive into customer pain points and build a product that's more in line with your market's most important problems and add value in your sales process (without being pushy or salesy). Our guard rails help members avoid costly mistakes and save multiple years of time. Your motivation and sense of urgency will naturally increase as you see other members break through milestones. 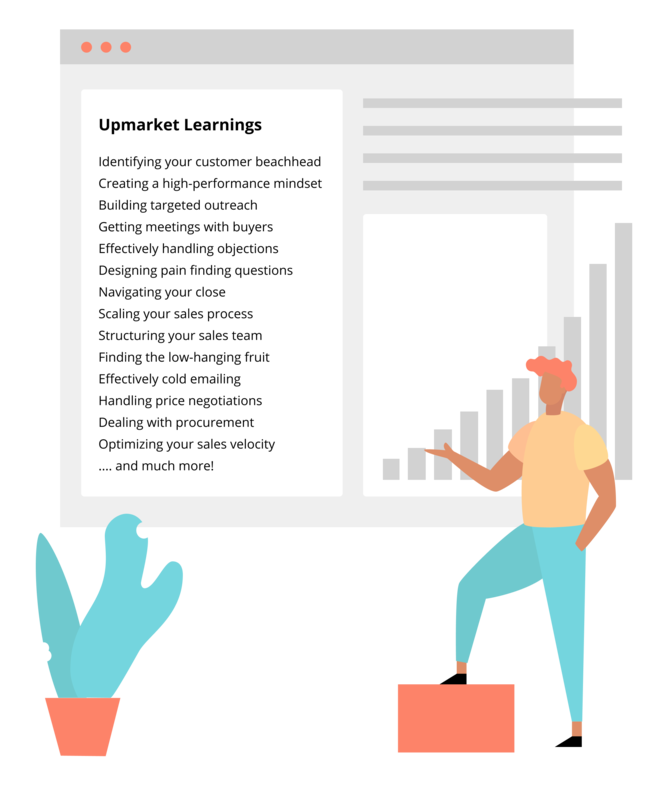 You're in good hands–Upmarket Coaches have taken multiple B2B/SaaS product lines from scratch to $5M+ ARR. 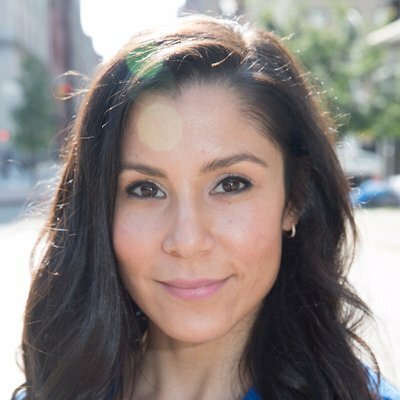 Juliana Crispo is one of the 50 people you should know in Sales & BD. Although initially failing at sales, Juliana became a top 3 performing rep out of 800 others at Meltwater, a SaaS which grew to 1,600 employees completely bootstrapped. Juliana repeated her process with companies in other verticals such as Fuze and Ghostery. Juliana is the Founder of Upmarket and is known to help companies double contract values and close rates, while cutting sales cycle time in half. 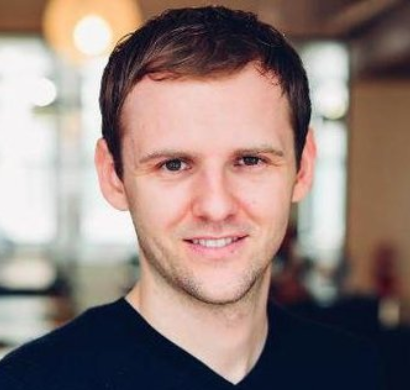 Conrad Wadowski was previously the Co-Founder of Teachable, where he build a repeatable revenue engine through initial scale and 1M users. Today, Teachable helps 20,000+ customers generate $300M+ online. Conrad has worked with dozens of venture-back companies and previously developed GrowHack, a 2,000+ member education program for startups featured in places like the WSJ and Forbes. Conrad is the Founder of Upmarket and helps companies generate new meetings through personalized outreach and growth processes. Get the free demo below to learn how to accelerate your path to product-market fit and double your sales in 90 days.